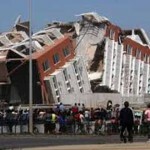 In response to the earthquake that occured in Chili on February 27, 2010. We would like to extend our Global Healing efforts that were first implemented this year for the Haitian earthquake victims to the victims and survivors of the Chilean earthquake. Saturday, March 13th is the date we have chosen. As we said before, please understand that, though it would be great if we could all walk on the 13th, it is more important that you conduct a walk. So if that date doesn’t work for you, or if you have already planned a walk in which you could incorporate the GHR, please know it is more important to have a walk at a time that works for you than to not have an event at all. If you have not had a GHR walk yet, perhaps you can combine your efforts to include both locations- Haiti and Chile. letting Shalom, Salaam, Peace, Paz have its way with us. undone by the mysteries of creation’s ways. …into the life of each of our neighbors, even those in Chile. This entry was posted in Disaster: Earthquake, Response: 2010 Chili Earthquake by ellenmeuch. Bookmark the permalink.